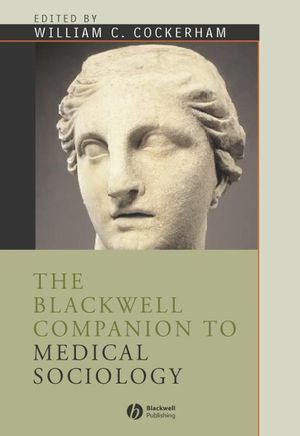 The Blackwell Companion to Medical Sociology is a comprehensive collection of twenty-six original essays by leading medical sociologists from all over the world. The articles are organized both topically and by region to provide thorough coverage of the concerns, issues, and future directions of the discipline. This invaluable resource is the most informed, complete, and up-to-date reference on transnational medical sociology available today. William C. Cockerham is Professor and Chair of the Sociology Department at the University of Alabama, with dual appointments in the School of Medicine and the School of Public Health. He is the author of The Global Society (1994), The Aging Society (1996), Health and Social Change in Russia and Eastern Europe (1999), Sociology of Mental Disorder (fifth edition, 1999), and Medical Sociology (eighth edition, 2001), and co-editor of Dictionary of Medical Sociology (1997) and Readings in Medical Sociology (second edition, 2001). 17. Society, Health, and Health Care in Sweden: Örjan Hemström. 20. Transformation of the Health Care System in the Czech Republic – A Sociological Perspective: Hana Janeckova.